Add your Aubergine (eggplant), Sugar, Salt, Thai Basil, Lime Leaves, Salt and Chilli and allow to simmer until the Aubergine is fork tender and the sauce has thickened, stirring occasionally. (8-10 mins). a) If you are cooking the meat from raw: Use the same amount specified in the recipe to feed 4. Cook the paste in your oil, add about 1/4 of your coconut cream until bubbling and that’s what you’ll cook your meat in. Once white throughout, continue with the following steps. b) A reputable trusted green curry paste is preferable. 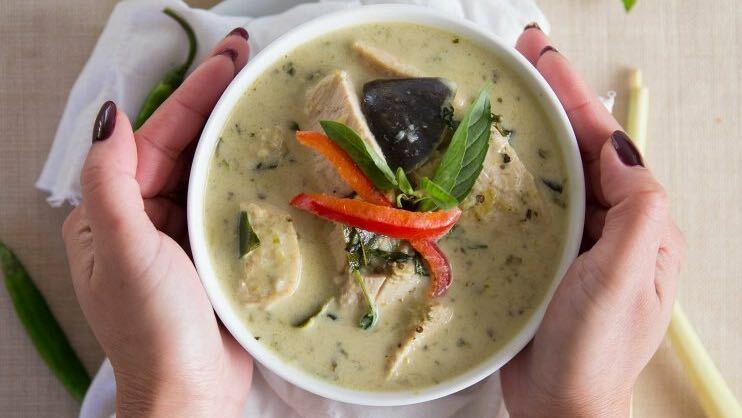 However, if your green curry paste is lacking flavour then consider adding one of all of the following: 1 clove of garlic, 1 shallot, 1 tbsp coriander (cilantro) and 1 green chilli. c) After slicing your Aubergine, place in water to prevent browning. Heat a pan, add the rice and water, cover and cook on high heat for 15 minutes. Turn the heat to low and simmer the rice for a further 3-4 minutes, making sure all the water has been absorbed and the rice is tender. Take off the heat and, using a spatula, fluff up the rice grains. Serve.